A root perforation is a communication between the root canal system and the supporting tissues of the tooth or the oral cavity. Furcation perforation is a mechanical or pathological communication between the root canal system and the external tooth surface and occurs in the anatomic area of a multirooted tooth where the roots diverge. The etiologic factors responsible for perforation can be broadly categorized into (i) procedural mishaps, (ii) resorption, and (iii) caries. Other factors responsible for perforation include operator's experience, tooth location, and anatomy. Iatrogenic perforation frequently occurs due to misaligned use of rotary burs during access preparation, during scouting for canal orifices in the pulp chamber floor, or during postspace preparation. Less frequently iatrogenic perforation may result due to lack of attention or experience of clinician while attempting to locate canal orifice in calcified canal system. Occurrence of iatrogenic perforations in endodontically treated teeth varies from 2% to 12%. Effective management of perforations represents a challenge even for experienced endodontists. However, if diagnosed early and properly managed with material of good sealability, long-term retention of the tooth is possible. With the advances in endodontic radiography, cone-beam computed tomography (CBCT) has been a valuable diagnostic tool in various stages of endodontics, and accurate detection of perforations is one of the indications. It has shown higher accuracy in detecting root perforations than digital periapical radiography. Perforation repair is indicated in a tooth of strategic importance either by nonsurgical or surgical approach. In recent years, a conservative nonsurgical approach is preferred due to the use of dental operating microscope which provides better magnification and illumination. Various materials such as zinc oxide–eugenol, amalgam, super- ethoxy benzoic acid (EBA) cement, dentin chips, calcium hydroxide, composite resin, glass ionomer, and resin-modified glass ionomer have been used to repair perforations; however, mineral trioxide aggregate (MTA) is widely used because of its biocompatibility and sealing ability. 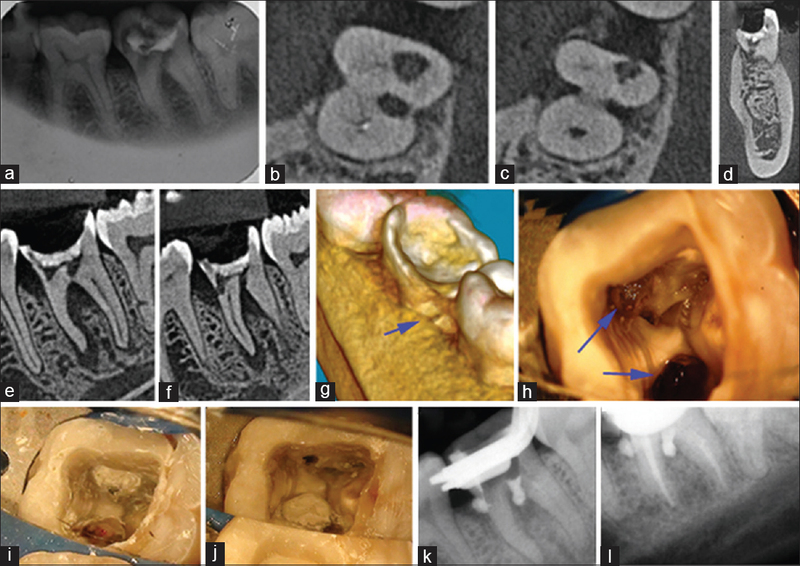 This report describes nonsurgical management of iatrogenic furcation perforation in mandibular molar with the aid of CBCT as a diagnostic tool and its repair with MTA under an operating microscope. A 26-year-old female patient reported to the department of conservative dentistry and endodontics with pain and pus drainage in the left mandibular molar tooth for 1 month. The patient had visited a private dental practitioner for root canal treatment in the same tooth 2 months ago. Clinical examination revealed that mandibular left second molar (tooth #37) had temporary restoration and was tender to percussion and palpation. Pulp vitality test revealed no response. There was no mobility, sinus tract, or swelling noted. A 4-mm deep probing depth was found on mesial aspect of the tooth with pus drainage. Radiographic examination revealed radiolucency in the pulp chamber floor and furcal alveolar bone and mesially on the cervical aspect, indicating overextended preparation [Figure 1]a. Further clinical exploration of the pulp chamber established the presence of furcal and mesial wall perforations. Thus, a diagnosis of pulp necrosis with symptomatic apical periodontitis and iatrogenic perforation was established. To accurately determine the location and extent of the perforations, a CBCT image of the region was requested. A verbal and written consent was obtained from the patient, and CBCT images were taken with CS 9300 three-dimensional (3D) digital imaging system (Carestream Dental LLC, Hatfield, PA) with 80 kVp tube voltage and 10 mA tube current. CBCT images including axial, coronal, sagittal, and multiplanar were obtained with a volume thickness of 90 μm at an interval of 180 μm. On analysis of the CBCT images, the perforation of furcation and lateral mesial wall was clearly appreciated [Figure 1]b,[Figure 1]c,[Figure 1]d,[Figure 1]e,[Figure 1]f. The 3D image was reconstructed to visualize the level of lateral perforation mesially [Figure 1]g. The patient was informed about the prognosis and the possibility of crown and/or root fracture in future, and alternate options of extraction and rehabilitation with implant or fixed prosthesis were suggested. Despite an unfavorable prognosis, the patient consented to save the tooth endodontically. The treatment strategy was explained, and informed consent was obtained for treatment. After administering 2% lignocaine local anesthesia (Lignox A, Indoco Remedies Ltd., Gujarat, India) and under rubber dam isolation, the access cavity was modified, perforations were identified, and granulation tissue was removed with an endodontic spoon excavator [Figure 1]h.
The area was gently rinsed with 1% sodium hypochlorite (Nice Chemicals (P) Ltd., Kochi, India) and saline (Denis Chem Lab Limited, Kalol, India) to control hemorrhage and dried with cotton pellets. Under dental operating microscope (OPMI Pico, Carl Zeiss, Oberkochen, Germany), the canal orifice was blocked with paper points, and perforations were sealed with white MTA (ProRoot MTA, Dentsply Tulsa Dental, Tulsa, Oklahoma, USA) using amalgam carrier and compacted gently using a hand plugger [Figure 1]i and [Figure 1]j. No internal matrix was used since the size of perforation as determined by CBCT was small. An intraoperative radiograph revealed adequate sealing of the perforations with slight extrusion of MTA [Figure 1]k. A moistened cotton pellet was placed over MTA, and access cavity was temporized with Cavit (3M ESPE Dental Products, St. Paul, MN, USA). After a week, the MTA seal was assessed clinically and the root canal treatment was completed with conventional technique. Fiber post (Glassix Nordin, Chailly-Montreux, Switzerland) was placed in the distal canal, and access cavity was restored with composite resin (Tetric N-Ceram, Ivoclar Vivadent AG, Schaan, Liechtenstein). The tooth was kept under observation for 2 months, following which a full-crown restoration was placed. A 24-month recall radiograph revealed complete healing of the furcation and lateral perforation area, and the patient was asymptomatic [Figure 1]l.
A 51-year-old male patient reported with pain and pus drainage in the right mandibular first molar for 1 month. History revealed visit to a private dental clinic for root canal treatment 2 month ago. On clinical examination, the mandibular right second premolar and second molar were missing, and the mandibular right first molar (tooth #46) was restored with temporary restoration [Figure 2]a. The tooth had mild tenderness on percussion and was not responsive to pulp vitality testing. The tooth had no mobility and no evidence of sinus opening or swelling, and periodontal probing depths were about 3 mm buccally. Pus discharge was noted from the buccal gingival sulcus. The tooth was associated with a carious supernumerary tooth mesially [Figure 2]a. Radiographic examination revealed partially obliterated pulp chamber and radiolucency from pulp chamber to furcation area. Radiolucency was noted periapically on mesial root and furcal area as well. Proximo-occlusal caries was evident on the supernumerary tooth, and it was not clear if the supernumerary tooth was fused (partial or complete) to the molar or was separate [Figure 2]b. A diagnosis of pulp necrosis and symptomatic apical periodontitis/lateral periodontitis was established, and on re-entering the access cavity, a diagnosis of furcal perforation was confirmed. To accurately determine the location and extent of the furcation perforation and to rule out the relation (separate, fusion, or concrescence) between #46 and supernumerary tooth, a CBCT image of the region was requested. Following consent, CBCT images were made as described in Case 1. The axial, coronal, and sagittal slices were analyzed, and tooth #46 and supernumerary tooth were not fused at any level [Figure 2]c,[Figure 2]d,[Figure 2]e,[Figure 2]f,[Figure 2]g,[Figure 2]h. The patient was informed about the prognosis and the possibility of crown and/or root fracture in future, and alternate options of extraction and rehabilitation with implant or fixed prosthesis were suggested. However, the patient was willing to save the tooth endodontically, and hence, a written consent was obtained from the patient, and stepwise treatment was started. Tooth was isolated under rubber dam, and after removal of temporary access filling, hemorrhage and granulation tissue were noted on pulpal floor [Figure 2]i, green arrow]. The access cavity was modified, and granulation tissue was removed with endodontic spoon and irrigated with 1% sodium hypochlorite and saline. Cotton pellets were used to control hemorrhage. On the distal aspect of pulpal floor, gouging was evident [Figure 2]i, yellow arrow]. Once the bleeding stopped, the canal orifices were blocked with paper points, and the perforation was sealed with MTA mixed with sterile saline. MTA was carried using an amalgam carrier and gently compacted with an endodontic plugger [Figure 2]j. No internal matrix was used before sealing since the size of perforation was 1.8 mm × 1.3 mm (<2 mm). A #10K size file was used confirm the patency of canal orifice [Figure 2]k. The tooth was temporized with Cavit (3M ESPE Dental Products, St. Paul, MN, USA). After 24 h, the patient was recalled, and the setting of MTA was confirmed. Root canal treatment was completed by crown-down technique, and the patient was advised the removal of supernumerary tooth [Figure 2]l.
The supernumerary tooth was extracted, and fixed bridge prosthesis was fabricated. A 24-month recall radiograph revealed complete healing of the furcation defect, and the patient was asymptomatic [Figure 2]m.
Due to an increased demand to retain natural teeth by geriatric patients, clinicians are treating more aging patients, which is associated with greater occurrence of procedural errors. Endodontic mishap like perforation poses challenges in diagnosis and management. Perforations have been reported to lower the prognosis of endodontic treatment to 54%–56%., However, perforation repair for a tooth of strategic importance should be attempted whenever possible. According to Regan et al., there is a paucity of evidence-based research upon which treatment decisions can be based. According to Tsesis and Fuzz, the most important factors that influenced the healing were the time lapse between perforation and closure, and the location of the perforation. In a retrospective study by Krupp et al., the outcome of root perforation repaired with MTA was investigated, and the study showed two prognostic factors for healing: the presence of a preoperative lesion at the perforation site and direct contact between the perforation and the oral cavity. 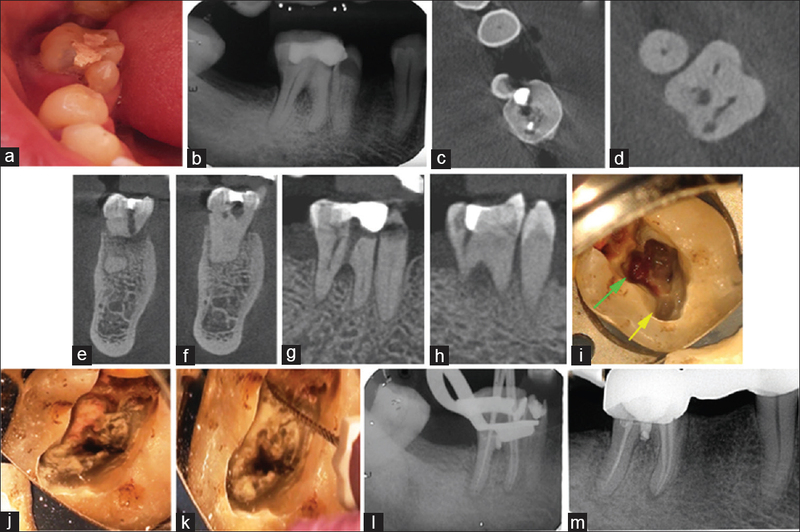 Recent advances in endodontic practice enhance the clinician's ability to diagnose and successfully treat perforations., Recent data suggest that newly introduced materials for the treatment of root perforations, clinical application of electronic apical locators, and use of dental operating microscopes are important in the successful management of root perforations. According to Ball et al., precise identification of perforation location can help dictate the type of repair material used. Hence, in the present cases, CBCT imaging facilitated the diagnosis by determining the accurate location of perforation defects., Other advantages of CBCT imaging include determining the size of defect, 3D reconstruction, and assessing morphology of adjacent structures. However, it is important to remember the major drawback with CBCT scans which include high radiation dose and financial costs compared to conventional radiographs. According to Shemesh et al., by reduction of the scanned volume, the radiation dose can be minimized. During perforation repair, establishing an artificial internal matrix before placement of repair material has been recommended to prevent the extrusion of material into the periradicular tissues and to control hemorrhage. Zou et al. found calcium sulfate when used as an internal matrix, affected the sealability of MTA, however did not allow its extrusion. In contrast, Collaplug (an absorbable collagen material), although did not affect sealability of MTA, was not a good barrier against overextension since it was not pressure resistant. Recently, Sharma et al. used MTA with metrogene sponges as an internal matrix in long-standing perforation repair cases and found favorable healing. Various reports have suggested that MTA can be used without the internal matrix due to its biocompatibility and ability to form cementum and regeneration of periodontal attachment.,, The success of perforation repair without barrier may be attributed to location (furcal and lateral) and perforation size, with small diameter defects (<2 mm) having low risk of extrusion., In the present report, internal matrix was not used since the greatest dimension of the defect was <2 mm as determined by CBCT, and importance was given to gently place MTA without pushing it beyond the perforation. MTA is hydrophilic and the presence of moisture promotes setting and expansion inside the defect., Bioactivity and ability to form hydroxyapatite crystals on the surface of MTA are associated with its sealing ability and hard tissue induction potential. It is also stated that the MTA-to-dentin attachment was entirely mechanical wherein unset MTA may penetrate into the dentin interface and form mechanical interlocking. Gorni et al., based on the results of a long-term follow-up study, confirmed the effectiveness of using MTA as a sealing material in root perforations and in particular its excellent tolerability. This case report presents favorable clinical outcome of furcal perforations repaired with MTA. It emphasizes a stepwise approach in the diagnosis and treatment planning for successful clinical and radiographic outcomes. Recent advances in imaging, biomaterials, and magnification enhance the clinician's ability to manage complex perforations. CBCT is a valuable imaging technique, which can be considered in specific clinical situations to facilitate diagnosis and treatment planning. Fuss Z, Trope M. Root perforations: Classification and treatment choices based on prognostic factors. Endod Dent Traumatol 1996;12:255-64. Regan JD, Witherspoon DE, Foyle DM. Surgical repair of root and tooth perforations. Endod Top 2005;11:152-78. Tsesis I, Fuss ZV. Diagnosis and treatment of accidental root perforations. Endod Top 2006;13:95-107. Gorni FG, Andreano A, Ambrogi F, Brambilla E, Gagliani M. Patient and clinical characteristics associated with primary healing of iatrogenic perforations after root canal treatment: Results of a long-term Italian study. J Endod 2016;42:211-5. Shemesh H, Cristescu RC, Wesselink PR, Wu MK. The use of cone-beam computed tomography and digital periapical radiographs to diagnose root perforations. J Endod 2011;37:513-6.
de Chevigny C, Dao TT, Basrani BR, Marquis V, Farzaneh M, Abitbol S, et al. Treatment outcome in endodontics: The Toronto study – Phases 3 and 4: Orthograde retreatment. J Endod 2008;34:131-7. Ng YL, Mann V, Gulabivala K. A prospective study of the factors affecting outcomes of nonsurgical root canal treatment: Part 1: Periapical health. Int Endod J 2011;44:583-609. Pace R, Giuliani V, Pagavino G. Mineral trioxide aggregate as repair material for furcal perforation: Case series. J Endod 2008;34:1130-3. Pontius V, Pontius O, Braun A, Frankenberger R, Roggendorf MJ. Retrospective evaluation of perforation repairs in 6 private practices. J Endod 2013;39:1346-58. Krupp C, Bargholz C, Brüsehaber M, Hülsmann M. Treatment outcome after repair of root perforations with mineral trioxide aggregate: A retrospective evaluation of 90 teeth. J Endod 2013;39:1364-8. Tsesis I, Rosenberg E, Faivishevsky V, Kfir A, Katz M, Rosen E, et al. Prevalence and associated periodontal status of teeth with root perforation: A retrospective study of 2,002 patients' medical records. J Endod 2010;36:797-800. Ball RL, Barbizam JV, Cohenca N. Intraoperative endodontic applications of cone-beam computed tomography. J Endod 2013;39:548-57. Min KS. Management of root canal perforation by using cone-beam computed tomography. Restor Dent Endod 2013;38:55-6. Kothari HJ, Kumar R. Endodontic management of a mandibular second premolar with perforating internal resorption by using MTA and cone beam computed tomography as a diagnostic aid. J Conserv Dent 2013;16:380-4. Shah DY, Khopade ST, Jain PM, Dadpe AM. Delayed repair of multiple perforations compounded with formocresol osteo-gingival necrosis. Saudi Endod J 2018;8:50-4. Rafter M, Baker M, Alves M, Daniel J, Remeikis N. Evaluation of healing with use of an internal matrix to repair furcation perforations. Int Endod J 2002;35:775-83. Zou L, Liu J, Yin S, Li W, Xie J.In vitro evaluation of the sealing ability of MTA used for the repair of furcation perforations with and without the use of an internal matrix. Oral Surg Oral Med Oral Pathol Oral Radiol Endod 2008;105:e61-5. Sharma S, Kumar V, Logani A. Management of long-standing perforation with mineral trioxide aggregate using metronidazole containing collagen as an internal matrix. Saudi Endod J 2017;7:123-7. Mente J, Leo M, Panagidis D, Saure D, Pfefferle T. Treatment outcome of mineral trioxide aggregate: Repair of root perforations-long-term results. J Endod 2014;40:790-6. Hashem AA, Hassanien EE. ProRoot MTA, MTA-angelus and IRM used to repair large furcation perforations: Sealability study. J Endod 2008;34:59-61. Camilo do Carmo Monteiro J, Rodrigues Tonetto M, Coêlho Bandeca M, Henrique Borges A, Cláudio Martins Segalla J, Cristina Fagundes Jordão-Basso K, et al. Repair of iatrogenic furcal perforation with mineral trioxide aggregate: A Seven-year follow-up. Iran Endod J 2017;12:516-20.